The Bombardier Q400 avionics are centered around a system developed by Thales Group. 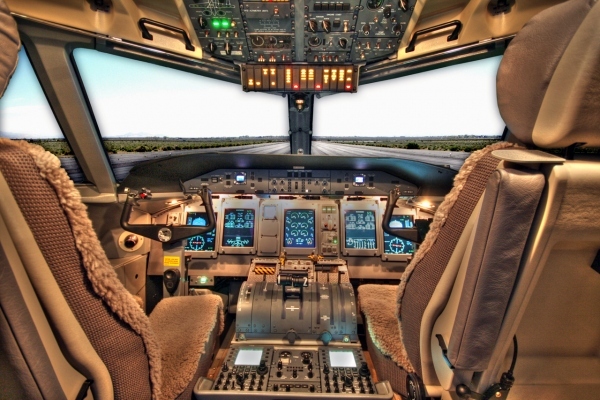 Bombardier selected Thales to build the avionics systems for the Q400 turboprop aircraft. The Q400 avionics are based on a modular system that makes replacing or upgrading parts easier. The Q400 has many different avionics components built by different manufacturers. 5 glass screen displays make up the main portion of the avionics system. The 5 screens display all the important information, with two primary flight displays (PFD) and three multi-function displays (MFD). The Q400 can also have up to two flight management systems (FMS), that are located in the center console. The FMS is built by Universal Avionics Systems Corp. The Q400 has seen recent upgrades to its avionics systems including new products built by ACSS, an L-3 Communications & Thales company. ACSS has some new components that allow for ADS-B capability on the Q400 (FAA's NextGen satellite based air traffic control). The Bombardier Q400 also has an optional head-up display that is built by Rockwell Collins. It is the HGS 4100. Above Bombardier Q400 avionics photo by Rick Rydell on Wikimedia Commons. Modifed by FlyRadius. Below are some of the optional/standard avionics components for the turboprop. Bombardier Q400 NextGen Avionics: This refers to the NextGen name that was given to newer Q400s that have interior upgrades. Bombardier DH4 avionics: "DH4" is the Q400s IATA code that is primarily used by airlines to identify the aircraft. Bombardier DH8D avionics: "DH8D" is the ICAO code for the airplane and is used by airlines, air traffic control and others. To learn more about this name visit the DH8D aircraft page. De Havilland Canada DHC-8-400 avionics: This is the model name for the turboprop. De Havilland was the previous division of Bombardier that built the aircraft. The De Havilland name is no longer used in marketing by Bombardier, so it is called the avionics Bombardier DHC-8-400. DHC-8-400 is the official model name for the turboprop that is used by aviation regulators to identify the aircraft. De Havilland Dash-8-400 avionics: the Dash-8-400 name is the name that was previously given to the aircraft by Bombardier. The Q400 was apart of the Dash-8 series program of turboprops. Bombardier then decided to change the name of those aircraft to the Q series turboprops and the Dash-8-400 became the Bombardier Q400. More on the Dash-8-400 name is found here.